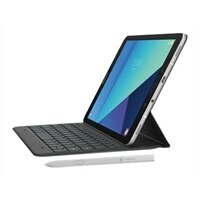 Samsung Galaxy Tab S3 - Tablet - Android 7.0 (Nougat) - 32 GB - 9.7-inch Super AMOLED (2048 x 1536) - microSD slot - ...The Samsung Galaxy Tab S3 is the perfect business tool to engage your customers and inspire employees to do more and collaborate. It delivers improved performance, security and productivity in an ultra-thin and ultra-light design. Take notes and annotate documents and presentations with the precision S Pen. Expand your multi-tasking capability through an optional POGO keyboard. Seamlessly work between your Galaxy Tab S3 and Samsung smartphone wherever business takes you with Samsung Flow.